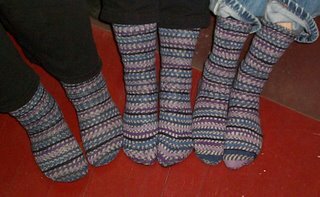 of three people wearing their hand knit Regia socks all in the same color way to knitting group on the same night? We were also graced with a visit from the lovely Petronella. 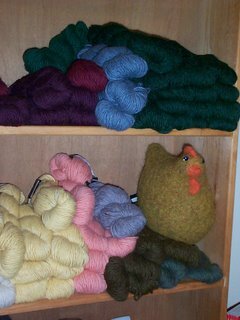 She checked out the shop and then decided to roost for a while with her kin on the Pastaza shelf. Today’s UFO is a pair of socks for my chiropractor. I credit visits with her with keeping my shoulders and wrists in good shape in spite of all the knitting I do. The yarn is my own handdyed sock yarn that you can get at the shop in Cambridge or at my Etsy shop. As you can see, I’m very close to being done with these and will, hopefully, be able to list them as a Finished Object soon. Oh wow! I have never seen so many identical socks all in one picture before! Very cool. Who knew we'd all show up with same socks! It was very funny when we figured it out. You'll love that colorway. It was a lot of fun to work with. Yay, Lucy! Glad to see you blogging, and on Blogspot, nonetheless! Hurrah! Wow, Arianna! I'm honored to be on your feed reader. It makes me feel like I've arrived! Sorry you couldn't make it to group but I'll see you Monday. whoa sock freaks. you guys are weird. i only wear that colorway on fridays.... (and might i mention HA- that's cool, esp w the lines matching). uh, LOVE the chicken... did the baron knit like 5 already? i wicked admire that particular knitter. I'm gonna start working on the spinning for my vet and crew. 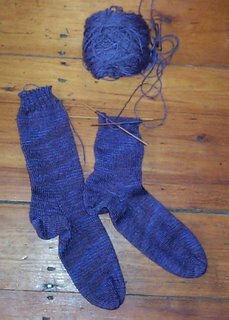 the girls who knit can get skiens, but i think the vet doesn't knit, so i'll have to make her something cool. she really rules. Patience made the chicken. There's a link to her blog about it. She's been having quite a felted animal phase. The Piano Tuna was only the beginning!